The Idea Center will be hosting a free workshop on how to grow your business online. The workshop is sponsored by Google and is part of their campaign, Grow Your Business Online – Let’s Put Your City on the Map. The idea is to help local businesses learn how to claim and manage their Google listing on Google Maps. The event will also cover how to use many of Google’s free tools, such as Google Analytics and Webmaster Tools, to help you grow your presence online. Google’s stats are impressive as to why it’s important to have an online presence. Google says that businesses that are online grow 40% faster than those that aren’t. They also say that local businesses that have correct and complete business information can help boost the economy of their community. 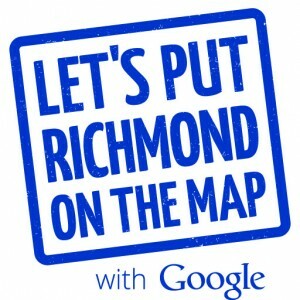 According to Google, “this could be worth up to +$300k a year; in large cities it can be up to +$7m.” The Idea Center wants help grow your business and put Richmond on the map! The event will take place October 22nd, 2015 at the VHDA: Virginia Housing Center. The event will run from 12-4pm and lunch will be provided. This event is open to anyone in the Richmond area. The Idea Center will lead a presentation on how to claim and manage your listing on Google Maps. From 3-4pm they will stream a live streaming video from Google on how to grow your business online buy using Googles SEO tools like Google Analytics and Webmaster Tools. The Idea Center team will be to answer any questions you might have. Please bring a laptop computer along with a Google username and password that you already use to manage your business, such as Gmail or YouTube. If you do not have a Google username and password for your business we will make sure you get signed up from one at the workshop. The Idea Center is passionate about Richmond, VA businesses and we want to do everything we can to help Richmond prosper. Come meet other Richmond businesses, learn how to grow your business, and let’s put Richmond on the map!